Check out Gayle’s contribution to two new books recently published for the “In The Trenches” series of CharityChannel Press. 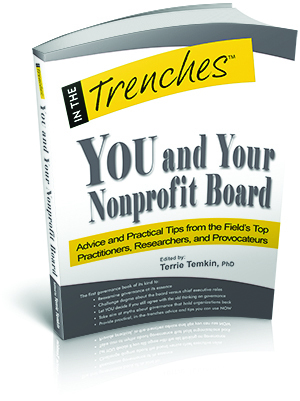 When You and Your Nonprofit Board, edited by Terrie Temkin, arrived in our mailbox, we had to read it from cover to cover. Gayle’s contribution, “You’re Not the Boss of Me: the Board Chair and CEO Relationship,” is one of 46 thoughtful essays by America’s leading writers on nonprofit governance. Whether you are new to the field or have been immersed in it for years, you will find new ideas to help you navigate today’s fast-paced, information-saturated reality in which wise practice is rapidly evolving. I know that we did. Order You and Your Nonprofit Board from CharityChannel today! What if you could sit down with 25 successful nonprofit consultants and ask them what makes their businesses tick? In The Nonprofit Consulting Playbook: Winning Strategies from 25 Leaders in the Field, editors Susan Schaefer and Linda Lysakowski have compiled a first-of-its-kind insight into the everyday lives of consultants to the nonprofit sector. This collection of firsthand articles takes the reader on a journey that spans a consultant’s professional life—from the decisions that formed the business to a detailed set of options for winding it down. The beauty of this book lies in the honesty of its contributors. They write openly about the decisions that guided their business models, their early mistakes, and their lessons learned. It’s a fun, informative read that gets into the minds of successful consultants who have consulted for at least a decade. The Playbook’s first-person storytelling has a style that will both inform and entertain. Most importantly, it has the power to transform your business—or your future business—in ways large and small. From insider retellings of client stories to state-by-state registration requirements, its contents will guide basic business decisions you have to make. What can I do to prepare myself before I start consulting? How should I determine my scope of business? How should I set fees and get off to the right financial start? Which marketing strategies work best? How do I close a deal with potential clients? How can I grow or reinvent my business? How do I regroup when business is slow? What information should I include in contracts? What state regulations might apply to my business? Look for Gayle’s contribution, “The Work We Do for Love” which describes how she gives back, balancing her volunteer service and our paid work for nonprofits. Order your copy from CharityChannel today!